Peter from Monochrome Meath emailed me asking us to let you know about an upcoming b+w workshop he is running on the weekend of September 16th. It sounds great! If you would like to attend then contact Peter through the Monochrome Meath website. “… I am delighted to confirm that the Landscape B&W Photography Workshop to be run in the Burren in county Clare is now set for 16th, 17th & 18th of September. The cost of the workshop is €185 per person. Taking you from the initial camera exposure, through development of the film and finishing with the print, this weekend workshop promises to be an unmissable event. The workshop is designed to suit both beginners and advanced film photographers and caters for those shooting 35mm, medium format or large format. As well as scheduled demonstrations, I will be on-hand to assist each participant during the weekend, whatever level they are at. Coating of Liquid Emulsion on canvas & then printing on it. We will be based in Ballyvaughan which is just two kilometres from the Buren College of Art which is where our Darkroom facilities are located. Ballyvaughan is a lovely village located on the coast with lots of pubs and restaurants. All the locations we will be photographing are within a ten minute drive. I have negotiated a group rate for the highly recommended Logues Lodge Hotel. They are offering us a reduced bed and breakfast rate of €40 for single rooms en suite. The lodge serves meals all day and I have dinned there and found the food excellent. The college has two darkrooms equipped with excellent enlargers and facilities. There is a third room for film development which can be used at any time over the weekend. In fact, the darkrooms are open until 10pm each day which provides us with great opportunities to come and go as we please. The workshop will start at 4pm on the Friday and finish at 5pm on the Sunday. Places are limited and the hotel is holding rooms for the next week, so please let me know as soon as possible if you wish to attend this workshop. If anyone prefers to stay at an alternative hotel or B&B etc., then that’s perfectly fine. To book your place on the workshop, a deposit of €85 is required with the balance of €100 to be paid two weeks before the workshop. The special hotel rate of €40 per night can be paid on departure. This is a short trailer for the upcoming documentary film Finding Vivian Maier Trailer. Looks like it will be compulsory viewing, if you’re a fan of mid 20th century street photography. I wrote a few posts about Vivian Maier here and here and here, and certainly I’m fascinated by this discovery and look forward to seeing an exhibition of her work sometime. I have been informed that Jackie Nickerson will be speaking on Arena on RTE radio 1 tonight (7.30pm). She will be discussing the Photo Ireland festival. Jackie exhibited in the Sirius in Cobh in 2010, and spoke to students at CIT in March 2010. Miriam King was at that talk, and wrote about it in two parts, here and here. Powerful Portraits: What’s in a Face? Not in Dublin for Photo Ireland Festival? Faffing about in London? Then get yourself into The London School of Economics this evening. Photographer of the rich, famous and powerful, Platon, will be speaking to celebrate the publication of his new book, Power. I’m not sure if this photo makes it into Power, but how cool is Christopher Walken?! If you are in London, then get thee to the London School of Economics, Hong Kong Theatre, Clement House, Wednesday, July 6th. It’s free, first come, first serve. 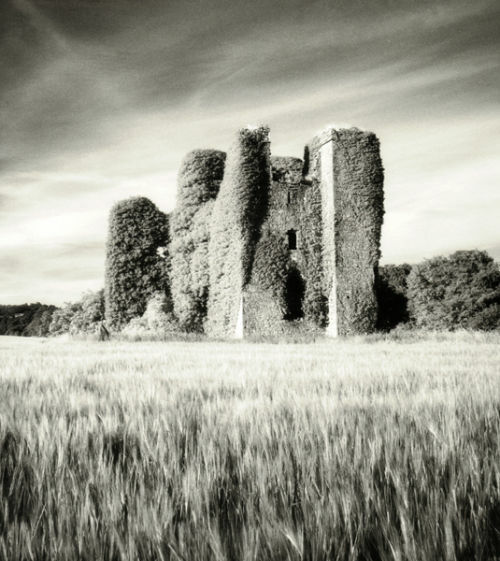 Stag & Deer opened their exhibition, “Home”, in association with Photo Festival Ireland 2011, on Friday last, July 1st. The exhibition is running on North Great Georges St. in Dublin, and is a great opportunity to see these two photographers, and in a space you wouldn’t often have a chance to occupy. Karen Miranda Rivadeneira is a 2005 graduate of the School of Visual Arts in New York City. Since 2006, she been working on projects that deal with identity and intimacy, collaborating with native communities and relatives as subjects for various photo-based projects. Karen’s work, Other Stories, some of which is showing in Home, was granted the New Works Photography Award by Enfoco. Dante Busquets attended the San Francisco Art Institute where he studied photography with artists Pirkle Jones, Jack Fulton and Reagan Louie. ante recently received the grant Descubrimientos PHE México DF from the festival PhotoEspaña ’09, and the Leica Grant at FotoFest in Houston TX, USA, 2008. Stag & Deer is an exhibition-making project facilitating artists’ requirements by providing contemporary art space to exhibit work. We deal mainly with the medium of photography and our goal is in showcasing emerging contemporary art to the public. Our plan is to have exhibitions in temporary galleries and in site orientated locations. The exhibition is open Tuesday to Saturday, 12 – 4pm, running until July 15th. Cork Analogue Photographers collaborated with Guerilla Exhibition for a calculated attack on the streets of Dublin, on Friday morning, July 1st. The location was kept top secret until the morning, then the twitter machine kicked in and it went viral! Part of Photo Ireland festival 2011, we “attacked” a disused shopfront on Drury St., brightening up a drab and grimy left over from the tiger bubble with some street art. This was a bit of a departure from Guerilla Exhibitions usual style of putting a number of different prints up, pop-up gallery style. 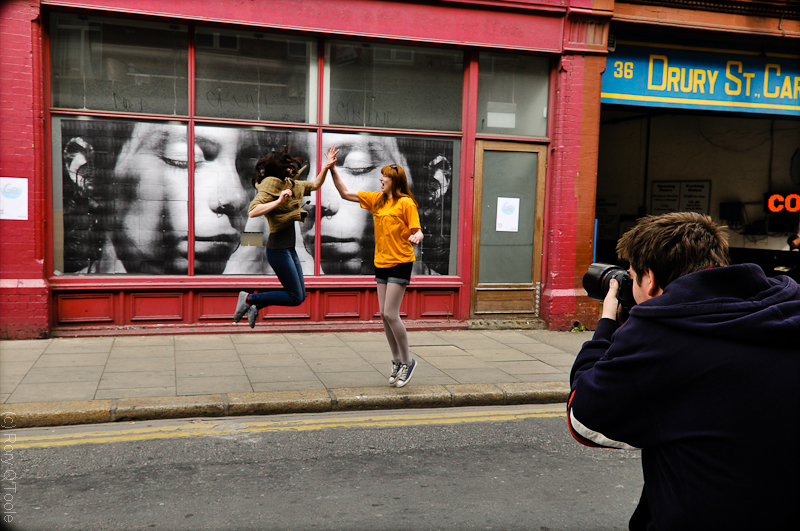 Instead, in tune with Photo Ireland festival’s theme of collaborative change, a negative was selected from Cork Analogue Photographers, and scanned and blown up by the Guerrilla’s, to create an enormous (6m wide) print to cover the whole shop front. The blow up was printed on 185 sheets of ordinary printing paper (special thanks to Exhibit A in Dublin for the scanning and printing). This was the first of it’s kind to be seen in Dublin, and it looks fantastic. There was a lot of measuring, planning, talking, measuring, sticky dots and fingers crossed in the hope that it would all come together. Here’s some photos of the work in progress.